Scott "Crimes Against Humanity" Lively: Russia Can Best The Gays With Rainbows! Home/Featured/Scott “Crimes Against Humanity” Lively: Russia Can Best The Gays With Rainbows! Scott “Crimes Against Humanity” Lively: Russia Can Best The Gays With Rainbows! “The rainbow belongs to God and was created by Him as a symbol of His authority over creation. However, with a simple judo move, the Russians could catch the ‘gays’ in their own trap, and at the same time rescue God’s rainbow from being dragged through the mud. Imagine the Russian Olympics taking place under a giant rainbow banner declaring that the rainbow belongs to God! And rainbow symbols incorporated in virtually every aspect of the games and the celebrations surrounding them. The scheme to display rainbows as a rebellious act by Hollywood celebrities, and left-leaning Olympic contenders would be rendered impotent. The ‘gay’ movement would be thwarted in its attempt to steal for itself what belongs to God and to all of us as His children. 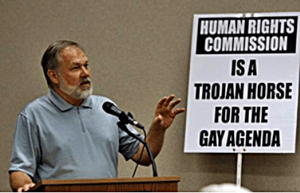 And, best of all, the entire world, including the ‘gays,’ would be reminded of the truth of the Bible: that God gave us the rainbow as a reminder not only that He judges sin, but that He forgives and heals those who repent.” – Fake minister Scott Lively, who is currently standing trial for “crimes against humanity” in Uganda writing on his hate blog. He may be evil, but he’s not to bright is he?